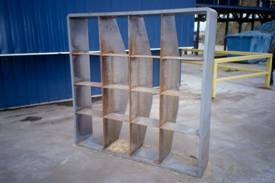 The linear knife grid approach was identified to apply a high level of shear failure of biomass. A commercial application to process alfalfa/timothy hay is shown below (Fig. 1). Figure 1. 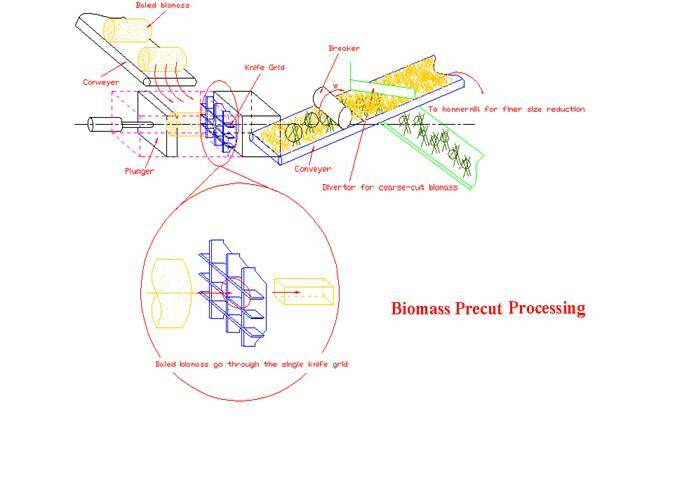 Knife grid concept to handle large bales, and large-scale commercial knife grid for biomass. A prototype knife grid was fabricated to evaluate size reduction energy, operating characterisitics, and particle size limits (Fig 2.). The grid with cut switchgrass (Fig 3), load–displacement curves (Fig 4), and energy versus refill runs (Fig 5), example mean separations for switchgrass are presented (Table 1). Energy use could be drastically reduced from ~30-100 kW-h/ton to <5kW-h/ton, and was attributed to shear cutting action and greater contact efficiency between biomass and machine elements. Cutting energy values determined for corn stalks and switchgrass under linear knife gird device were either smaller or agreed well with the reported values. Scaling up of the linear knife grid device for larger product sizes greater than 100 mm can be readily adopted, and could go as low as 25 mm for a highly engineered grid assembly.